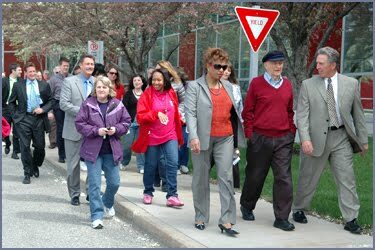 The Michigan Blues will participate in National Walk @ Lunch Day on April 30th. This event, championed by the Blue Cross and Blue Shield Association, encourages people to take steps toward better health—even in the midst of a busy work day. http://www.youtube.com/v/HN-Ft_-lJ_Q&hl=en_US&fs=1&color1=0x006699&color2=0x54abd6Thirty Blues plans across the U.S. will celebrate National Walk @ Lunch Day this year. Participants are invited to extend their lunch break and walk for 30 minutes. The truth is, walking away from work—for at least a few minutes—has the potential to re-energize employees and increase productivity. Walking also keeps the heart healthy, burns calories and increases energy levels. The Blues have a long history of encouraging people to walk. With the formation of WalkingWorks, the Blues have spread the word that walking provides significant health benefits. This Walking Works web site encourages people to begin a walking regimen and offers the tools necessary to make it happen. People can log their steps online, purchase pedometers, find health tips, and more. So, grab your co-workers, friends and/or family members and take a walk during lunch on April 30th. And then, keep it going! Find the time to walk as much as possible. Your body and mind will thank you for it. Michigan Blue Cross is hosting a free seminar about how to apply for free or low-cost medical insurance programs such as MIChild, Healthy Kids and Medicaid for adults today. Blue Cross Blue Shield of Michigan and Blue Care Network are committed to ensuring access to quality health care coverage to all ages. The expo is being held at Cobo Arena in Detroit. The event runs from 8 a.m. to 5 p.m. today, Friday, April 23, 2010, in the Ambassador Room at Cobo Hall in Detroit. Parking is free. Click here for more information. Our customer service representatives at Blue Cross Blue Shield of Michigan are getting lots of questions from members who buy individual plan coverage asking about changes in store from health care reform. We take a look at some of those changes as we conclude our week-long series exploring what reform means to you. Q: If I enroll in a new policy today, what benefits can I expect based on the language in the Patient Protection and Affordable Care Act? o Your policy will no longer have a lifetime dollar limit for benefits. o The Department of Health and Human Services will post regulations about what annual limits health insurers will be allowed to place on benefits. o Note: The Department of Health and Human Services has clarified this to mean that health insurers can no longer reject children under the age of 19 based on a pre-existing condition. The Michigan Blues have long followed the same policy. o Pre-existing condition exclusions are still permitted for persons over the age of 19.
o The Department of Health and Human Services will post regulations about the definition of “dependent.” Currently, the only requirements are that the person must be under the age of 26 and cannot have an offer of coverage from their employer (the dependent can be married). o The Department of Health and Human Services will post regulations outlining which services must be covered without cost-sharing. No health status rating – while this is required by health care reform, Blue Cross Blue Shield of Michigan never rates based on health status. No gender rating – while this is required by health care reform, Blue Cross Blue Shield of Michigan never rates based on gender. The new health care reform law targets the “donut hole” in Medicare Part D prescription drug coverage and provides community living assistance for people with disabilities. We explore the measures here as part of our series on what reform means to you. A: The “donut hole” for Medicare Part D prescription coverage refers to the point in time when a member reaches $2,830 in out-of-pockets costs for medications. Currently, members pay 100 percent toward all medication after their costs exceed $2,830 until their costs reach $6,440, at which time 100 percent of costs are covered. Q: Who qualifies for the $250 rebate for Medicare Part D? How do I receive my rebate? A: An individual who reaches the “donut hole,” or Part D coverage gap, will receive a $250 credit payment. The federal government will remit this payment by no later than the 15th day of the third month following the end of the calendar quarter in which the individual reaches the donut hole. Q: What does the Patient Protection and Affordable Care Act do for people with disabilities? A: Effective Jan. 1, 2011, the law creates a new national long-term care program for persons with disabilities that provides community living assistance services and supports. The so-called CLASS Act will provide benefits of at least $50 per day to help persons with disabilities to maintain community living. It will be financed by a new, voluntary payroll deduction – expected to be about $65 per month – by all working adults (persons are automatically enrolled and may then opt-out of the program). These funds may be used for home health care, adult day care, nursing homes and assisted living homes, among other benefits. However, persons must have contributed for at least five years to be eligible for the benefits. One notable feature of the Patient Protection and Affordable Care Act of 2010 – better known as health care reform – is the extension of coverage to high-risk individuals with costly medical conditions through the creation of insurance pools. The program is designed to help individuals whose pre-existing chronic or other conditions have made it difficult for them to afford or find insurance. As we’ve noted before, Blue Cross Blue Shield of Michigan is unique among insurers in that we never deny anyone coverage based on their medical history. Many other insurers, both non-profit and for-profit deem these people too costly to insure. As part of our ongoing series of what health care reform means to you, here’s a look at how the new high-risk pool program will impact people with pre-existing conditions. Access to the new high-risk pool program starts by July for people around the country. While regulations and clarification from the federal government are still forthcoming, the only eligibility requirements are for individuals to have a pre-existing condition and to be uninsured for six months without access to any other qualified coverage options, such as employer coverage. As part of our weeklong series exploring what the changes mean for Michigan Blues members, we delve into some of your most commonly asked questions. You can also check out yesterday’s post about individual-market policy impacts, or our earlier post outlining the changes more broadly. Tomorrow: High-risk pools and pre-existing conditions. All this week in this space, we’ll be sharing our responses to many of the most commonly asked questions posed by Blues customers who wonder how health care reform will affect their policies and families. The series is meant as a deeper dive into changes we first discussed in a previous blog post. While many of the provisions cannot be explained in further detail until we get guidance from the federal government, we’ll share with you what we know now. We’ll start with changes that will affect customers who get their coverage from one of our individual plans. Q: What changes will apply to my policy and when will they occur? · Your policy will no longer have a lifetime dollar limit for benefits. · Coverage of dependents is extended until their 26th birthday. Q: What happens to my policy if I or one of my dependents has a pre-existing condition? A: The Michigan Blues has only a six-month exclusion period for pre-existing conditions. As a result, if you were currently enrolled as of March 23, 2010, your pre-existing condition period will have already expired by the time the new changes from the law are effective. If you remain on this policy and then add a dependent after the effective date for the pre-existing condition prohibitions, your dependent, regardless of age, will still be subject to a pre-existing condition exclusion period based on the date that the policy holder enrolled in coverage. If you enroll in a new individual product any time after Sept. 23, 2010 and include a dependent under the age of 19, there will be no pre-existing condition exclusions.